I have not been able to write a blog like I should have by now, but there are so many things I want to cover, so please forgive me if this is a bit sporadic. First and foremost the real reason why I have been slacking about writing my blog… see well there was this one post here. Where I totally lied to you. I know you're shocked and in complete disbelief, well so was I when I realized what happen. 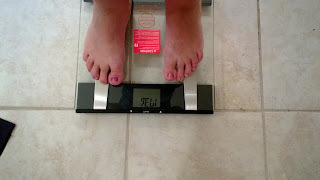 You see the picture with the scale? Well of course the scale is being honest but somehow I wrote “Officially 26lbs down” and that my friend was a lie. The truth is that really I was only 21lbs down – I’m not sure where the other 5lbs jumped on board other than wishful thinking. HA! Actually I’m okay with the fact that was 21lbs instead of the dreamy 26lbs, that is only because I know it is steadily coming off. I don’t need big chomping numbers I just need baggy pants LOL! I did feel bad because it was not a truth to you, then I went about trying to figure out how to clarify it, see I want this blog to be truthful about my journey with this running thing and with the weight loss. No sugar coating it and no lies. When I do reach 30lbs I want to – you know shout it out! I want to take that picture of the scale and be all excited and stuff, but that typo steals my thunder even before I get there. So there it is that’s the truth and although it’s not as dreamy as it initially sounded I perfectly fine with it. In the mean time I've also ordered a few things online and so through out the week I've opened a few cool packages and I want to share those with you too, so another promise post soon as well. I've noticed that I start thinking of all sorts of thing I want to write about but at the end of the week I focus on just running - and mind you that is what I have my mind set on most of the time but it's not all that happens. I hope I don't bore you too much in the future. But for now I just got back from a run with my husband (of all people!) and it was great but I think the shower is calling me.